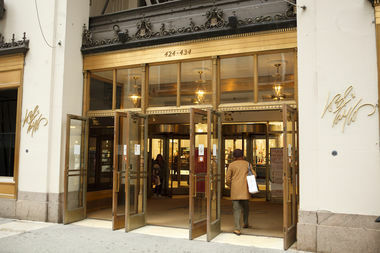 The department store will still operate a 150,000-square-foot outpost inside the landmarked building. Hi Commerce, which just launched in Park Slope, lets online shoppers buy from neighborhood mom-and-pops. Employee Kindell Keyes handed in the cash, and Goodwill staff were able to track down its owner. Marshalls said it will be hosting a full day of festivities for its grand opening on Thursday, Sep. 21. The Lexington Avenue Shopping Court recently opened at the corner of 56th Street. Black Barn's John Doherty and BLACKBARN Shop's Mark Zeff are combining their concepts at the food hall. These eco-minded, socially aware Brooklyn companies make furniture, wallpaper, lighting and counters. The cannons have stood guard outside Kaufman's Army & Navy since 1950, owner Jim Korn said. The redesign will kick off next year and focus on Steinway Street between 28th and 35th Avenues. The online retail behemoth may be moving into SoHo, according to a report. The market will debut Sunday, July 9, featuring 18 Queens vendors selling clothes, art, food and more.